This week, President Obama hosted the first White House Maker Faire, proclaiming a National Day of Making and encouraging young people to be designers, engineers, and inventors — not just consumers. And he called for more programs and activities to mentor and empower a new generation of Makers. You might expect that the Maker Movement in education will be a hot topic at ISTE this year – and you are right! This year there is a big focus on makerspaces and making in schools – which I’m glad to be a part of. Last year it felt pretty lonely to be one of the only speakers talking about it. But this year, there are numerous events and sessions about making, maker education, design, 3D printing, robotics, microcontrollers, e-textiles, programming, and more. 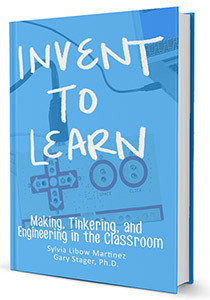 Sylvia Martinez, Co-Author of Invent To Learn: Making, Tinkering and Engineering in the Classroom, has compiled a Maker Playlist of the top Maker-related ISTE conference sessions and events. Friday, June 27, 8:00 a.m. – 5:00 p.m.
Friday, June 27, 2:00 p.m. – 6:00 p.m.
Sunday, June 29, 11:00 a.m. – 12:00 p.m.
Sunday, June 29, 11:00 a.m. – 1:00 p.m.
Sunday, June 29, 12:45 p.m. – 1:45 p.m.
Sunday, June 29, 2:00 p.m. – 4:00 p.m.
Sunday, June 29, 2:30 p.m. – 3:30 p.m. STEM in K-5: Beebots to WeDo! Monday, June 30, 9:30 a.m. – 1:00 p.m.
Monday, June 30, 10:45 a.m. – 11:45 a.m.
Monday, June 30, 12:30 p.m. – 1:30 p.m.
Monday, June 30, 1:15 p.m. – 3:15 p.m.
Monday, June 30, 12:30 p.m. – 2:00 p.m.
Monday, June 30, 4:30 p.m. – 7:30 p.m.
Monday, June 30, 5:15 p.m. – 6:30 p.m.
Monday, June 30, 5:30 p.m. – 7:00 p.m.
Tuesday, July 1, 9:00 a.m. – 1:00 p.m.
Tuesday, July 1, 10:15 a.m. – 11:15 a.m.
Tuesday, July 1, 11:45 a.m. – 12:45 p.m.
Tuesday, July 1, 1:15 p.m. – 2:15 p.m. Learn How to Use a 3D Printer – Right Now!